Scientists found that all cheetahs are genetically very close to each other. Cheetahs face difficulties in reproduction and are susceptible to viruses because they are genetically too similar. Mating between close relatives is the main reason for the threat of extinction that cheetahs face. This conclusion was reached by scientists at the St. Petersburg State University who studied the genome of the ferocious feline. An international team of scientists under the lead of scholars from the St. Petersburg State University studied the genome of the African cheetah, which is an endangered predator. They found that all cheetahs are genetically very close to each other, and this is the main cause of their reproduction problems and high sensitivity to the most common viruses. 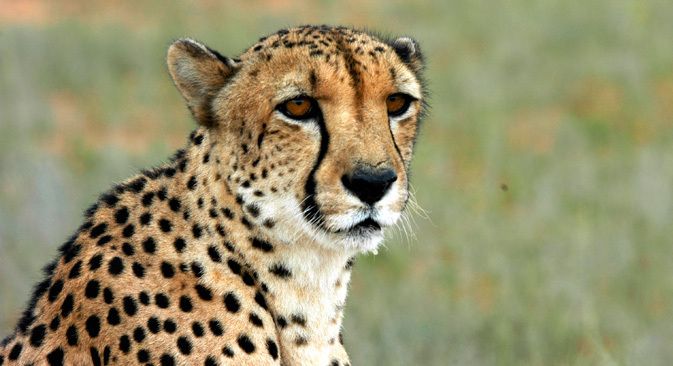 Scientists analyzed seven cheetah genomes - four from cheetahs in Namibia, and three in Tanzania. They decoded the genomes, and for the first time ever they assembled whole genome sequences. Results showed that compared to other cats, the loss of cheetah genetic diversity amounts to 90-99 percent. In order to determine why these wild cats are so similar genetically, scientists reconstructed their demographic history. It turned out that a sharp decline in cheetah genetic diversity happened twice. The first took place about 100,000 years ago during cheetah migration from North America to Asia and on to South Africa. The second occurred 10,000-15,000 years ago when the number of cheetahs declined sharply again causing them to reproduce through inbreeding. The reason for the second sharp population decline is not known. The study explains why, for example, a piece of skin transplanted from one cheetah to another is not rejected. After studying genes that regulate the predator's immune system, experts found that cheetahs have just a few variations of these genes; by contrast, a human has hundreds of them. Moreover, some of these genes turned out to be broken. This is why cheetahs can easily accept transplants from each other, but often die of viruses that do not pose a danger to other members of the feline family. The new data obtained by the international group of scientists can be used by specialists to preserve species and their genetic diversity.